Which Pearl would you choose?? Abalone is a type of mollusk that is primitive, uni-valved (which means single-shelled), and at least thirty million years old. There are only eight varieties of abalone, which is low, when compared to other pearl producing mollusks such as oysters and mussels. Different forms of abalone are found anywhere from California to Alaska, as well as in Korea, Japan, New Zealand, and Australia. Though abalone will produce pearls when in the wild, this is a rare occurrence. In fact, studies have shown that a fine, good sized pearl of over 15mm is found in nature only in about one out of every five hundred thousand to nine hundred thousand abalone. The reason that these pearls are so rare is that they require about 8 to 10 years to form (note that it takes only 24 to 36 months for the pearls to develop in pearl farms, as ideal circumstances are provided). As abalone are commonly subject to commercial fishing at about the age of four or five years. Therefore, they have not aged sufficiently for the creation of a pearl. Furthermore, not every kind of Abalone is able to produce pearls, and even in those that do, they require a very specific combination of elements in order for the natural pearl formation to occur; which includes everything down to what the abalone has to eat throughout the 8 to 10 years of the pearl’s formation time. Abalone pearls found in nature vary greatly in color and shape, and may either be solid or hollow. The shapes may be round, oval, flat baroques, or even giant horn-like shapes. The colors of the natural abalone pearls may be anything between royal blues and greens, and magentas, or silver pinks, golds, bronzes, silvers, crèmes, purples, and even mystifyingly beautiful combinations. It is even possible for a single abalone to produce several pearls of different shapes and colors. Natural abalone pearls grow within thick nacreous layers which are joined together with organic conchiolin. They are formed in a way that is quite similar to the way Oriental Pearls are formed, except that the nacreous layers in abalone are thicker. Akoya pearls are produced from the oyster known as Pinctada fucata martensii, which is the smallest pearl producer known in the oyster family. These pearls are known for their pristine round shapes, which make them an ideal and popular choice for necklaces and matching earrings. However, aside from being consistently round, they can also have a semi-round, baroque and semi-baroqe shape. Although Akoya pearls are also produced in China, they previously were considered the Japanese pearl, and were cultured primarily in Ehime, Mie, Oita, Nagasaki and Kumamoto prefectures. The water temperature of the ocean where they grow is considerably low, and fluctuates with the coming of each new season. Akoya pearls develop a unique luster and color, which is caused by the compacting of the aragonite crystals which form in the water during seasonal change. The ideal Akoya pearl is one that has the perfect amount of crystals as well as nacre, and is considered to be the most lustrous and beautiful of all pearls. To produce Akoya pearls, a nucleus is inserted with a mini speck of mantle tissue form previous oyster shells, creating a round bead that the nacre will begin to grow around. Depending on the size of the oyster, usually up to three beads can be placed in it. Once the beads are ready, the oyster is placed in the ocean and left for 6-18 months for cultivation. The longer the Akoya oysters are left in the ocean, the better chance the nacre has of growing and influencing the pearl, resulting in nicer looking and more valued pearls. Unfortunately, the longer period of time also means a higher risk is involved, as the oyster has more potential of dying or becoming damaged from storms and other ailments. The highest quality Akoya pearls are left in the ocean for close to two years. The average size of Akoya pearls range from as tiny as 2 mm to 9.5 mm. All sizes of these pearls can be used for jewelry purposes, but it is commonly the 5 -8 mm sized pearls that are used when making Akoya pearl necklaces. Due to the different size range of the Akoya pearl, it is one of the most popular pearl choices among woman. Akoya pearls come in a variety of colors, such as blue, green, pink, rose, cream, white, silver and gold. The characteristic hues are attributed to the nacre structure of the pearl, and for this reason, cultivators focus on producing pearls that are made with the right quantities of each ingredient. When it comes down to quality, the thicker the nacre of the Akoya pearl is, the more valuable and beautiful the pearl will be. Even though the Akoya pearl has been challenged by the look and luster of freshwater pearls, it still maintains its popularity today. This is because not only can it suit the taste and style of any occasion, as they can be worn elegant, chic or casual, but they are a taste of the true beauty that thrives and blossoms beneath the sea. Just about any pearl you’ll find today in a store, at a jeweler, or virtually anywhere else, is a cultured pearl. Cultured pearls are an effort made by pearl farmers in order to maintain the delicate balance of nature, while still responding to the demand for pearls in the jewelry marketplace. Culturing pearls began at the very beginning of the 20th century, when several inventors discovered the techniques required in order to cultivate pearls. The most famous of these inventors is a man named Kokichi Mikimoto. To create the pearl, the farmers introduce a foreign object, such as a piece of tissue, or a mother-of-pearl bead, into the mollusk. The automatic reaction of the mollusk is then to deposit layers of nacre around the object, in order to stop it from irritating. Pearl farmers can create cultured pearls in either saltwater or freshwater, and in different types of mollusks. Cultured Saltwater Pearls – these are pearls which are farmed in salt water, and are grown in oysters. For each oyster, a maximum of one pearl can be grown. For this reason, saltwater pearls are much more rare, and therefore much more expensive than freshwater pearls. The countries that are best known for producing cultured saltwater pearls are: Indonesia, Burma, Thailand, the Philippines, Australia, and Tahiti. Cultured Freshwater Pearls – These pearls are farmed in freshwater, and are grown within mussels. As the irritants introduced into the mussels are much smaller than the ones injected into oysters in saltwater pearls, freshwater pearls tend to be much smaller than saltwater pearls. However, the technique for cultivating freshwater pearls allows for the fact that any given mussel may produce twenty pearls or more within one year. Among the many advantages of cultured pearls over natural pearls, the fact that ideal environmental conditions can frequently be provided mean that it takes a much shorter period of time for a pearl to be formed at a farm. Still, pearls can take several years to fully develop and should not be harvested to quickly as to compromise the quality of the nacre. For example, South Sea pearls, and Tahitian pearls will usually take between 2 and 3 years to form. Akoya pearls from Japan will usually take less time, at under 2 years. Chinese freshwater pearls are the shortest, at 18 to 24 months using the traditional method, and even less time than that with the latest, most recently developed technologies. One rule of thumb to which pearl farmers will hold, however, is that the longer a pearl is left to form, the larger it will be, and higher quality will result. Freshwater Pearls are a sweet, smaller, and often more irregularly shaped type of pearl that can be grown in a number of different species of freshwater mussels. The Japanese have also had a distinguished freshwater pearl farming history. In fact, Lake Biwa was once recognized worldwide for its high quality freshwater pearl production. However, by the time the 1970s hit, the Japanese had to bring pearl production to a complete stop, as Lake Biwa reached terrifying levels of pollution. The Japanese are now taking new steps to restart their freshwater pearl cultivation industry, and have been successful at producing beautifully large and unique pearls. However, due to the high prices of the Japanese freshwater pearls, they have remained a niche market exclusively for collectors. Among all of the gemstones available in this world, the pearl is absolutely unique. This is due to the fact that it is the only one which is formed entirely within a living being. Pearls are produced in two basic ways: the Natural way – without human intervention – and the cultured way – when they are farmed by people. Natural pearls occur when some form of irritant – be it a piece of shell, bone, scale, or even a parasite – lodges itself into a pearl producing mollusk such as an oyster, mussel, or abalone. To protect itself from the foreign body, the mollusk forms a nucleus over the foreign element, and continues to coat it with layers of nacre over the next several years. The factors that determine the size, color and shape of the pearl have to do with the size and shape of the nucleus, and the region of the ocean in which the mollusk resides. Furthermore, the majority of natural beds of pearl-producing mollusks have been depleted due to over-harvesting in the past. This is the reason that such efforts were made to grow pearls artificially, which the Japanese accomplished in the early 1900s, by planting a nucleus into the pearl-bearing mollusk, and then returning it to the ocean. The primary difference that exists between cultured and natural pearls is in the thickness of the nacre – the outer shell that holds the color and luster of the pearl. In order to make pearls more quickly, cultured pearls are usually implanted with larger nucleus than those which would begin a natural pearl. Even with the larger nucleus, it still takes two to three years to grow a fine pearl, so it’s easy to understand why time reduction is important to pearl farmers. It is recommended that if you do have the opportunity to buy a natural pearl, you should refrain from buying it unless it comes with an official gemological x-ray certificate, which proves that it is natural, and states its pearl quality. For something so rare, expensive, and beautiful, a little security is a must. South Sea pearls are known for their exceptional quality and beauty with their silvery white color. These pearls are notably larger than the “average” pearls, and are stunningly smooth and round. They are likely the rarest and most extraordinary pearls to be found in jewelry. The South Sea pearls come from the oyster pinctada maxima, which is a white-lipped type of the mollusk. 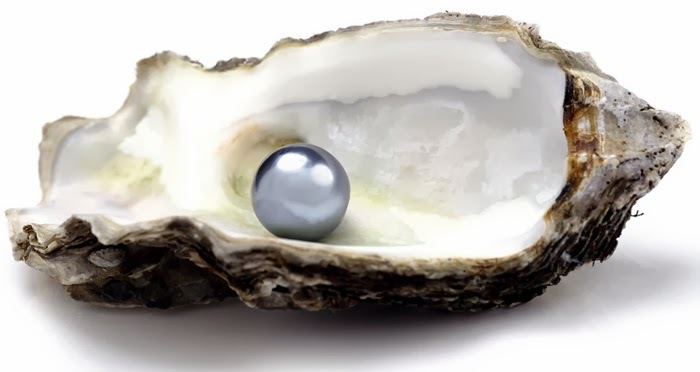 The oyster is quite large, much larger than the oysters that produce Freshwater and Akoya pearls, which explains the larger size of South Sea pearls. Due to the rarity and sensitivity of the pinctada maxima, the farming of South Sea pearls is quite challenging, and thus the pearls are costly. To produce the South Sea pearls, pearl farmers implant beads made of mother of pearl in the hopes that the conditions, and a bit of luck will allow for a perfectly round, lustrous, clean, and beautiful South Sea pearl. When it comes to South Sea pearls, the larger they are, the more valuable they become. Thus South Sea Pearl cultivators hope for frequent harvests of very large pearls in perfectly round shapes. However, the formation of South Sea pearls, like other kinds of pearls, is quite unpredictable, and even the slightest environmental change can produce changes in shape, or blemishes, or even no pearl at all. This is the reason that a perfectly spherical South Sea pearls are considered to be the ideal of the gem, and a South Sea pearl necklace made with near perfectly spherical pearls an exquisite piece of pearl jewelry. The three most common South Sea pearl shapes are round, semi-round, and button. Semi-Round – a pearl that appears to be round to the eye, but when measured with a caliper, the variation in the circumference is 2% or more. Button – this type of pearl has a variation in circumference of about 20%. Within this style, there are also “tall buttons” which are button pearls that appear round. South Sea pearls are only grown in tropical and semi-tropical regions called the South Seas, usually in the areas around the coast of Australia, Indonesia, and the Philippines. They are cultured, saltwater pearls available in shades of white, silver and gold. Tahitian pearls – also referred to as black South Sea pearls – are grown in the oyster called Pinctada margaritifera. This is, obviously, a pearl producing oyster, and is unique for its black lip, and its notably large size, with specimens commonly reaching a foot across and weighing as much as ten pounds. The only place in the world that this type of oyster can be found is in Polynesia (also known as Tahiti) and other Pacific Islands that lie nearby. Relatively new to farming, cultured black pearls have been available in Tahiti for less than three decades. Before that, they were considered to be extremely rare, and when a black pearl was discovered, it was worth a fortune. Its rarity increased as the Pinctada margaritifera began being hunted in the late nineteenth century…for its shell. Fortunately, re-population efforts have successfully rescued the species from extinction. Farming black pearls is a much easier process with Tahitian pearls that it is with white pearls, not to mention the fact that it is notably less expensive to do. This is a result of the abundance of protected atoll lagoons in the Tahitian region. The result is higher availability, allowing pearl lovers to buy Tahitian pearl necklaces, possibly the most beautiful of all pearl strands. Tahitian pearls are usually larger in size than the classic white Akoya pearls, ranging in size from 9mm to 18mm. Tahitian pearls are best known for their dark colorings. This makes the truly black pearls extremely rare, and quite valuable. If you should choose to buy a Tahitian pearl, you’ll find that they usually cost less than classic white pearls from the South Sea. A Tahitian pearl of satisfactory quality at about 9mm in size will usually cost around $200, while you could pay a few thousand dollars for the larger, 12 to 13 millimeter pearls of high quality. Mabe pearls come in a wide range of beautiful pearl colors, which span from light pinks, to more bluish shades. The unique nacre of the mabe oyster allows for hues that are quite brilliant and rainbow-like. Their brilliance is quite breathtaking at times, especially in the rarest color, which consists of pink with gold swirls. It is this type of color which brings the value to the mabe pearls, as well as their rare superiority in texture and luster. Though they are quite lovely to look at, they will not be as expensive or valuable as “round” pearls due to the flat side. Due to this one flattened side, mabe pearls become the ideal choice for pearl jewelry such as earrings and rings which allow for a secure setting, and a concealed flat back. The mabe pearl first reached its popularity in the end of the 19th century, and from that time until the mid 20th century, many different efforts were made to attempt to cultivate the mabe pearl – most of which were in vain. Many hearts were broken, and most tries were fruitless. However, some pearl farmers continued to persevere with their research, and finally established breeding techniques for the mabe pearl oyster in 1970, followed five years later by the mass production of cultured pearl harvests. Keshi Pearls: Rejected by Oysters, Loved by Humans! Keshi pearls are quite unique in the way they are formed, when compared to the standard method of pearl formation. Usually, a pearl is formed when a substance such as a piece of shell becomes embedded in a mollusk such as an oyster. A type of infection ensues, and the oyster heals itself by developing a layer of nacre over the intruding substance, walling it from irritating further. Layers of nacre continue to form as long as the oyster is alive, and the result is a pearl. However, with Keshi pearls, there are two ways that the pearl can form, none of which has to do with the “usual” process as described above. The first way that the keshi pearl can form occurs when the oyster rejects and spits out the substance – the nucleus – before the development of the pearl has had the opportunity to finish. The second possibility is that the nucleus fractures and forms two separate pearl sacs – that is, circles of nacre – neither with a nucleus. Eventually, one or two nucleus-less pearls will usually form. Keshi pearls – also known as poppy seed pearls or seed pearls, as keshi means poppy seed in Japanese – may result from either freshwater or saltwater pearls. Keshi pearls are usually quite small in size, and as they do not have nuclei – upon which the shape of a pearl is usually determined – there is usually a large degree of variance in the shape of keshi pearls. Keshi pearls also come in a variety of different colors and shades, and are known for their luster and uncommon orient. This is a result of their composition consisting of solid nacre. As the nucleus is eventually expelled by the oyster before the pearl is actually formed, the keshi pearl consists entirely of nacre. Though this is true, keshi pearls are not given the classification of being a natural pearl. The reason is that keshi pearls are actually a bi-product of the culturing process, and not something that happens naturally. At one time, keshi pearls, especially of Tahiti and the South Sea, could be procured at quite the bargain; even for the most beautiful and rare samples. However, today keshi pearls are considered to be much more exceptional and infrequent. The reason for this is that both Tahitian and South Sea pearl farmers now x-ray their oysters to see whether or not the nucleus is still inside, or if it has been expelled. Should an oyster be found which has expelled its nucleus, it is re-nucleated before a keshi pearl would have the opportunity to develop. Thus the keshi pearls have become even more rare than they once were. Still, keshi pearls remain popular as they are made of solid nacre and therefore usually have quite a bright luster. Their variable shapes are frequently considered quite desirable to jewelers who wish to design something unique and innovative. Conch Pearls: Sunken Treasure From the Caribbean! In its natural state (that is, when it has not been cultured) conch pearls are among the rarest pearls anywhere in the world. In nature, they occur by chance, and as there are only so many conch pearls ever naturally formed, and among them, only 15-20% are suitable for pearl jewelry making, it makes them extremely rare. Black pearls, also frequently referred to as Tahitian pearls, or Tahitian cultured black pearls, are extremely unique and beautiful dark pearls that have become increasingly popular over the last few decades. This is quite the notable accomplishment, as pearls had temporarily slipped from fashion’s attention throughout the last quarter century. However black pearls, as well as their lighter cousins, are now well on their way back into the favors of jewelry lovers. Today’s black pearls are virtually always cultured, as the rarity of a black pearl found naturally in the ocean would make it extremely difficult to find, and thus not cost effective to pearl suppliers. A black pearl would occur naturally only in about one in every 10,000 oysters. Moreover, it is illegal to dive for oysters for the sole purpose of discovering natural pearls, as it endangers the oyster species. Therefore, black pearls are developed by way of a precise grafting process, performed by a skilled technician, with the Pinctada margaritifera, commonly known as the black lipped oyster of French Polynesia. Though referred to as “black”, black pearls are most commonly quite multicolored, most frequently appearing in a shade of metallic steel-grey. This coloring is a natural part of their development, as the black lipped oyster produces dark, multicolored secretions for its mother-of-pearls. Simply browse our black pearl necklaces for an example of the color spectrum. To form a quality cultured black pearl, approximately 18 to 24 months are required after the point of grafting. This allows enough time to achieve the desired thickness of at least 1.5mm from the nucleus of the pearl. Though frequently known as Tahitian pearls, black pearls aren’t produced solely in Tahiti anymore – though it does remain the most abundant supplier. After the mid-60’s, when Tahiti was still the only black pearl farming location, the Cook Islands, and Kiribati have entered into the market, producing approximately 3% of the global supply. Black pearls are a great deal larger than white and other pearls, growing to up to 12 inches in diameter – with a weight of up to 10 pounds – as opposed to the 3 inch maximum of the Akoya oyster’s white pearls. This allows a much larger nucleus to be implanted into the oyster.